Outliner is a Photoshop-compatible plug-in for Windows designed by ImageSkill Software that can work as with commercial software like Adobe Photoshop, Adobe Photoshop Elements, Corel (Jasc) Paint Shop Pro, Microsoft Digital Image Suite as free like software IrfanView, XnView. Run setup file. Installer try to find suitable graphic hosts. Choose one of them from the list. If you want to install plug-in in other folder, select item "Other path" and set path. In this case you must set "Plug-ins path" of your graphic host to setup folder. Plug-in may be compatible with other graphic hosts as well. In order to uninstall plug-in run uninstall.exe or use Add and Remove Programs item in the Control Panel or Start Menu. Use this tool for zooming. Click to zoom in. Right-click to zoom out. Click and drag to pan images larger than the windows. Choose desired method for image contouring. Set background and foreground colors for outlining. This plug-in works under RGB or Grayscale image with 8 or 16 bits/channel with or without transparency. 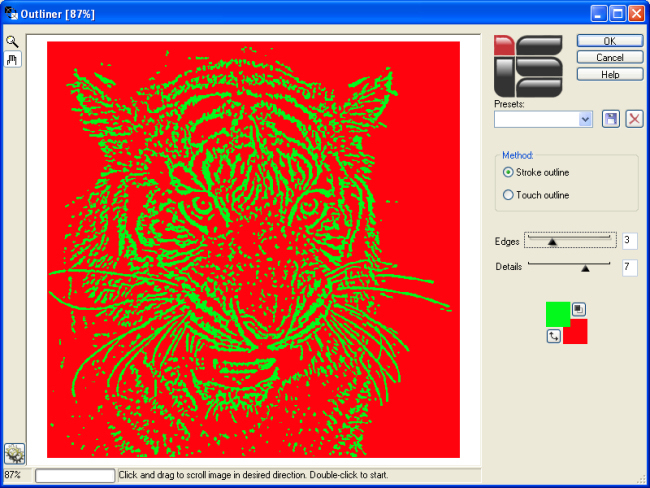 Open an image in your graphic editor. Run the Outliner plug-in. (For example, in the Adobe Photoshop use "Filter->Image Skill->Outliner" menu item). Adjust plug-in parameters for desirable result achievement. Press OK button and return to host.